Welcome to the latest dinar update. As gurus give updates about a potential fictional revalue, I will give updates about an imminent redenomination. I know it has been a while since the last update. I really don’t follow the dinar as close as I use to. Since I have been free from this scam I have been busy doing other things. As most people know I have another blog that deals with world economics. The Blog is known as BVAWE. I started a new series on the blog called The Real Battle. It deals with the rise of the New World Order. It talks about these people using oil and the banking structure to come to power. While I was working on this new series I came across this. “Over the last year, the circumstances of the war in Iraq have created the phenomenon of businesses trading in new Iraqi dinars. Many of these businesses advertise or conduct business over the Internet, and suggest that the Iraqi dinar, much like the Kuwaiti dinar following Operation Desert Storm, will increase in value exponentially following United States military involvement in Iraq. Most investors purchase dinars from websites established particularly for selling dinars or from major auction websites. FinCEN has been receiving inquiries regarding the legitimacy of websites offering Iraqi dinar sales. While it is not necessarily illegal to buy or sell Iraqi currency, there are a number of risks and compliance concerns for the financial community. For example, Iraqi officials state that it is illegal under Iraqi law to export dinars. Therefore, in addition to questions about the source of the currency, and the potential for investment or securities fraud, businesses offering to sell dinars may also pose the risk of being used to fund terrorism or as a vehicle for money laundering. FinCEN also has a particular interest in these businesses because they may be money services businesses required to comply with the Bank Secrecy Act. Years ago when I invested in the dinar I did a search to see if the dinar was a scam. Back then it was hard to find out any information on the currency outside of the dinar forums. Now it seems that there are independent articles all over the internet warning people about this. Well better late than never I guess. Here are a few examples. “Going on 10 years, this scam hasn’t turned anyone into a millionaire, or even a thousand-aire. In fact, since the fall of Saddam Hussein’s regime, one note has been worth less than a tenth of a U.S. penny. Word of warning today: Expect a flare-up in dinar marketing. Sellers often refer to the government of Iraq revaluing its currency to make it appear stronger and more attractive. Wouldn’t you know, just as the dinar’s value plunges further, Iraq parliament is considering just that. This is redenomination language. When they talk about printing new notes because their currency has become weak they are talking about printing a new series of dinar and that is a redenomination. And that is what this scam is all about. It seems to me that these days there are all kinds of scam warnings about the dinar. Wait a minute…The Iraqi dinar is a scam? Maybe this video will help explain one of the scam aspects. When I decided to post another dinar update I did a quick search and found this Warning from Washington State about the dinar. “The Washington State Department of Financial Institutions is warning consumers about potential scams regarding Iraqi Dinar currency exchange services. While foreign exchange scams are not new, the sudden popularity with the Dinar and resulting consumer complaints to our banking partners is concerning. Even though this warning is from 2011 this is the first time I saw it. So as you can see the Iraqi dealers are the only ones providing liquidity for the currency they are selling. Talk about a conflict of interest. When the Redenomination goes down how many dealers will there be left to provide the liquidity needed to exchange the investment? I have included a contact form on the home page of this blog. Anything that is put there is kept confidential and will not be posted on this blog without your permission. From time to time I get requests to contact people but keep in mind I am not interested in debating anyone about this investment. My time is limited. There are people who got into this investment because they believe that this fictional revalue is prophetic. They believe it can be found in biblical prophecy. As far as these people are concerned no amount of reason will convince them. Even if you explain the logic of why it won’t happen they won’t believe it because to them it is a matter of faith. I would like to personally address these people now. 1. First you should know that Kim Clement is a false prophet. He has said a number of things that have not come to pass. I observed him when he first came to TBN. I marked the things he said at that time and waited to see if they would come to pass. The time of the prediction came and went and what he predicted did not come true. Here is an extensive list of some of the many wrong predictions this man has made. So do you really want to trust this guy for dinar analysis? When I first invested in the dinar I wondered if the dinar was part of biblical prophecy. I am a long time student of the bible and I began to see if I could make a connection. The more I studied the more I saw that the dinar has nothing to do with biblical prophecy. The other blog I have which I mentioned earlier is called Biblical Views and World Economics or BVAWE. It contains the prophecy research. It also explains world economics and how it relates to what is on the horizon. Although I will be quick to say it is based on my opinion and independent study. Right now the new series (The Real Battle) is taking all my writing and research time, but if anything interesting happens in the dinar world I will be sure to put it on this blog. If you want to see the other blog click the link below and see what a trillion dollars looks like. Like you, I “invested” in this Iraqi dinar. I bought some in 2004, and held them for two years. 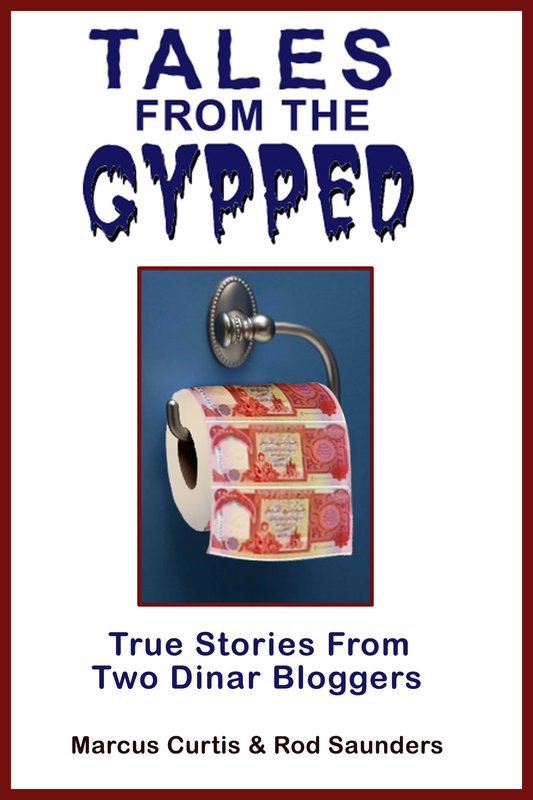 I practically LIVED on the Iraq dinar blogs ( Investors Iraq, etc..) Finally, my search for the real truth (i. e., learning how currency trading really works), led me to see the reality to get rid of mine. I ended up losing about 30 percent of my money (buying at a high price and selling at a low price). But, that was years ago, and I was certainly glad to be free of that addiction to ignorance that I once had, regarding the Iraqi dinar scam. I must admit that it’s been years since I have even checked up on this scam. Recently, I was on Youtube and thought that I would check to see what was on there about the Iraqi dinar. Initially, I was totally surprised to see that people are still buying into this scam! But, then I realized that greed and ignorance breed together to create a hybrid lie that can destroy any sense of reason and reality, concerning this “investment”. I just wanted to thank you for putting up this blog and letting people know the TRUTH about this scam called the Iraqi dinar. Further, I agree with you totally on the redenomination of the banknotes; people will not get one penny “richer” with this redenomination. In fact, the Iraqi government may very well have a “grace period” to exchange the old Iraqi dinars for the lower- denominated banknotes. And, guess who will profit once again? : You guessed it; these dinar sellers will spring up all over the internet trying to charge fees just to exchange the Iraqi dinar to the new banknote. I think that we can both admit that this has to be one of the best scams to ever be rolled out to the public. Please keep your blog going, and don’t let the naysayers get you discouraged. I will post as I can. Thank you for the words of encouragement. The big question to me is what will the dealers do after the redenomination? They may stay around and try to make money off the exchange. It is possible that there will be a lot of angry people looking for the pumpers and the gurus when this comes to pass. That is why these pumpers are mad at dinar douchebag for exposing them. Will the people who purchased dinar pursue class action lawsuits against the dealers and the pumpers? If this is the case it will be easy to find their location. If sam I am can find them then the authorities can too. Will they face criminal charges? The truth is they will pay a heavy price for deceiving people and destroying their lives. The bible says a person will reap what they sow. Other religions refer to this as Karma. In the end they will get what is coming to them. If legal fees begin to climb for dealers they might just close up. There are two things that are certain at this point. First who ever is caught holding dinar when they redenominate will lose. and second In the end there are going to be a lot of very angry people once they finally realize they have been lied too. So Marcus, to make certain I understand all I have just read. You are categorically stating that the Iraqi Dinar will NEVER Revalue, only redenominate, and when that happens the new currency will only be valid in country. The currency I have will be and even now is only worth what someone is willing to buy it for, and will NEVER be worth more than the 1166 current value? Do I have that right? That is pretty close to what I believe, This belief is backed with two years of research and several government documents along with internet links. This does not mean that Iraq won’t revalue. Typically revalues are done to keep inflation in check. They are typically around 3 to 7 percent. The object here is that by raising the exchange rate you curb inflation. If a large revalue is done across the board then that will have the opposite effect. A Revaule is equivalent in a lot of ways to adding money to the currency supply. The amount of currency in circulation has an impact on what the currency is worth. So the more currency in circulation the less it is worth. The less currency in circulation the more it is worth. Typically when to much currency is in circulation it can lead to hyperinflation. sometimes if inflation is to high they will adjust the exchange rate through a Redenomination as a measure to stop massive inflation. Iraq currently has over 70 Trillion in its money supply. over 30 trillion is outside of the banks in Iraq. If they raise the value too much the opposite will happen. it will actually increase the potential for hyperinflation. This is why you cannot find one instance in history where a Revalue has happened above 35 percent. If the dinar Revalues to one penny it would be a Revalue of 1000 percent. This will cripple the iraqi economy and hyperinflation will destroy their currency. Revalues typically happen when a nation’s GDP and economy are experiencing massive growth. Revalues are meant to head off inflation due to growth in the GDP. This is how currency works. To say that there will be a revalue that will make everyone wealthy is not only a lie, but it is contrary to the very way money works. Iraq announced they are going to redenominate back in July of 2011, Around January of 2012 they announced that they put the plans on hold. The government is now partly divided as to whether or not to pursue the redenomination plans. If they do redenominate it is something that will only happen in country. If they don’t then the value will never rise above 1000 IQD to 1 USD unless they reduce their money supply. You will need to use the banking system to cash in your dinar and none of the banks in America that I know of provide liquidity for the dinar. They stopped ever since Iraq announced there intentions to redenominate. This is what I believe in more detail. It is hard to say what Iraq is going to do. The one thing they are not going to do is make everyone in America rich simply for owning dinar. Thanks for the feedback brother! I spent hours reading all you have written to better educate myself about this whole drama. I was given Dinar as a gift for having given to another. This appeared to be the part of “men dumping into my lap!” It seems obvious there is a different way that will occur. Perhaps not in this life. I just listened to and downloaded “Spanish Spice.” I love good guitar music and my very first listen to yours gives me good reason to want to hear more. I’ll friend you on FB. Thanks again for doing what I, and many others, would not have taken the time to do. Too much detail for me. I tend to be more of a “mouthpiece” either in writing or speaking things out. I have tried to pursuade those who gave me the dinar that this is not what it appears to be. They seem to have bought into the “brainwashing” that has taken place with these people. In turn they have replied that maybe it’s possible you have been hired to create negative info against the Dinar and these people. They who have ears to hear will not hear! Thanks again, and I will continue to monitor and chime in from time to time. Yes I get that alot. I have been accused of trashing the investment for the dinar dealers on multiple e-mails. I guess the same people believe that I trash the dinar to get people to sell it back to the dealers and then the dealers sell it to other people. This is a sick Joke. First if people decide to get out they can sell to anyone they want. They don’t need to sell it to a dealer. They can sell it on ebay with the many other people who figured out this is a scam. What possible angle could a dealer have to employee someone who criticizes the very currency investment they are trying to sell? This makes no sense. I have also been accused of Being Sam I Am from dinar douchebags. I have also been accused of working with him and co writing his site. Nothing could be further from the truth. I think that people are so emotionally attached to this investment that they become irrational. You cannot reason someone out of a position they did not use reason to attain in the first place. People have gambled the farm on this with the promise of wealth and a lot of times this investment becomes their last and only hope. The dealers and the pumpers feed of of this. I put a form on the home page so people can contact me. When people fill this form out it goes directly to my e-mail. These comments remain confidential. So as a result I get all kinds of scenarios as to my motives and my so called part in dinar douchebags, even though I have nothing to do with that site. The truth is I was invested in the dinar for over 2 years to the tune of 3.6 million. I was zealous for this investment. When I learned the truth I tried to expose all the lies told to me that caused me to buy dinar in the first place. I sold all my dinar and took a loss. I have not made 1 penny off of this investment. I am glad you like Spanish Spice. I am working on recording more music. Currently I am working on more material that will be uploaded to the site soon. Thanks for taking the time to comment. I will check out your site soon. You forgot to mention why I can’t find you on Face Book? When I clicked on the FB icon on your page it just takes me to my page on FB. Searching for you under Marcus Curtis does not bring up anyone that I could identify as you and music. I did not know it was doing that. Let me look into it and I will try to fix the button. Thanks for letting me know about this problem. Allow me to explain the scam aspect to you. There is a problem with your analysis. First, as you pointed out the currency has gone up from October of 2003 when it was introduced to 2006. It has not gone up a great deal since 2006. So the last time the currency had a significant increase was 7 years ago. And that makes this a good investment? Do you know why the currency has not gone up any more in the last 7 years? I know it went from 1170 to 1166 recently, but that is not a significant increase. That move was made to control inflation. Second, It does not matter how great a dinar deal is or where you purchased it. Most people don’t buy this expecting to make a little money. If that were the case there are plenty of other investments without the major risk that this one has. Almost everyone buys dinar because they think they are going to be rich. They think they are going to become millionaires. They believe they will have more money overnight then they could make in 5 life times. Almost everyone who buys dinar knows very little about currency exchange and how money really works. Many people are first time investors. I have personally known people who have sold everything they have to purchase this crap with the hopes of being rich beyond their wildest dreams. They believe in the dinar because of the pack of lies they have been told. These lies are told by a network of pumpers who work for certain people who sell dinar. So let me enlighten you and tell you the truth. 1. There has never been a Kuwait Revalue. 2. The dinar is not exchanged for oil. 3. Oil in Iraq is sold in US dollars only not dinar. The oil supply does not matter because it is not used as a reserve to back the Iraqi currency. 4. The US does not have trillions of dinar. 5. New notes to replace part of the current dinar series have never been printed. 6. Iraq announced they will redenominate the currency back in July of 2011 with details. They talked about printing the new currency and adding Kurdish language and symbols. 7. Bush never said that the war in Iraq will pay for itself. The administration said that sales from oil in Iraq will help rebuild the country. Oil is sold in US dollars only! 9. The dinar is not part of biblical prophecy. 10. There will not be a revalue, in fact there has never been a revalue above 35 percent in all of the history of currency. For the dinar to go to one penny would be a revalue of 1,000 percent! 12. Executive order 13303 does not protect your dinar investment. In fact it is illegal to export dinar from Iraq and sell it. The Iraqi banks and the CBI look the other way because the export of the dinar brings in US dollars which are added to their reserves. Meanwhile people are spending all that they have because they are being told lies. They are being told that they will become millionaires if they invest in this worthless crap. Trillions of dinar are exported and billions of US dollars go right into Iraq’s reserves. And you want me to believe that this is not a scam? I can prove everything I just said. Throughout the course of this blog there are several links in the articles that I have written that go to official government documents and news articles that explain all the lies in detail. I should also mention that maybe you should take the time to click on the links in this post. On each link I only posted a small part of an article or a title. Much more information can be found. The truth is out there! Open your eyes!